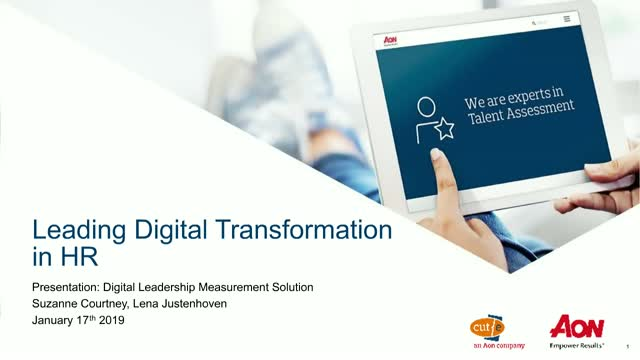 Leading digital transformation in HR: Are you ready? Yesterday’s way of working is obsolete. Today’s fast-paced, technology-fueled business environment means that the demands on employees, and the way in which they work, have changed. Are your employees and your organisation ready to cope with the digital future? •Why digital transformation of the workforce is a priority for all organisations. •The core set of competencies that is needed to succeed in tomorrow's workplace. •How digital readiness can be measured and assessed. •How to approach digital transformation and take action right now. There will be the opportunity to interact live with our panel on the day by taking part in live polls and posting your questions, many of which will be answered during the webinar. The results are in: HR, recruitment and talent practitioners have been taking part in our global ‘digital readiness’ survey. The nine-minute online survey assesses your organisation’s ability to attract, hire, reward, develop and retain digitally-ready talent. It asks whether you feel your leaders are equipped to drive digital change, whether your culture supports digital working and whether your employees are ready and able to work collaboratively and virtually in a digital environment. Register for this webinar to benchmark your own HR digital readiness. - Interpretations, insights and recommendations into organisations current digital capability with analysis into the extent of organisational digital readiness globally and in the UK. - How to make better decisions when selecting, developing and rewarding digital talent. James Marsh, HRr; Jennifer Liston-Smith, MFC; Dr Sarah Forbes & Dr Holly Birkett, Birmingham Business School. Retaining employees through the transition to parenthood is now a mainstream tenet of most organisations’ talent retention strategy It’s been 5 years since Shared Parental Leave was introduced in the UK and Gender Pay Gap reporting has added further impetus to organisations’ efforts to retain women as well as men through the new parent transition. Many employers have reviewed, updated and introduced new programmes, policies and benefits. In this webinar we’ll be sharing the results and insights from My Family Care’s New Parent Transition Benchmark. It’s been designed to shed light on changes to benefits and policy in this area, high-lighting innovative practice and the impact that organisations have seen as a result. We’ll also be examining the findings of the latest research from the University of Birmingham Business School into the factors that enable or block the take-up of Shared Parental Leave. Panellists include Jennifer Liston-Smith, Director, Head of Thought Leadership, Coaching & Consultancy at My Family Care and Dr Sarah Forbes and Dr Holly Birkett of Birmingham Business School. In a world of uncertainty and changing economic direction, upskilling your workforce for the modern world should be the number one priority on your people and development strategy. But knowing where to start can be a challenging hurdle to overcome. Understanding first what is needed from your organisation and subsequently people is critical to developing and retaining the best people. Join James Marsh and our panel of employers, thought leaders and gender pay experts for an insightful and lively discussion. Jennifer Liston-Smith, Director, Head of Coaching, Consultancy and Thought Leadership at My Family Care and Ruth Thomas, co-founder and Senior Consultant at Curo Compensation will be providing expert insight and a broad perspective on the topic. Catherine Manson, Global Head of Communications and Corporate Affairs at Christie's and Sarah Gregory, Inclusion and Diversity Partner at leading law firm Baker & McKenzie will be sharing their gender pay gap journeys. James Marsh, HRreview; Charlotte Schaller, cut-e; Lauren Jepson, Vodafone; Dean Callaghan, cut-e. The world is changing: Brexit, industry convergence, digital transformation, increasing automation and the arrival of the information age. Is traditional recruitment keeping pace? It is time to rethink talent acquisition. Start talking the language of business and deliver tangible business value. Learn how Vodafone revolutionised finding future digital leaders with the award winning tool ‘the future jobs finder’. Artificial Intelligence in assessment is a current key debate amongst HR professionals. AI undoubtedly transforms some jobs – but it will also transform the role of the HR function in managing talent. If you want to get up to speed on how AI can be used in selection, understand the challenges it poses and how to manage these, then reserve your place now. The use of AI in recruitment and assessment is progressing quickly. Don’t get left behind. We look forward to meeting you. With a workforce that is ever-more age and life-stage diverse, it’s never been more important for organisations to enable their employees to combine Work+Family successfully. In this webinar we will share the highlights of My Family Care’s Work+Family Snapshot – exploring the challenges faced by working parents and carers, and their priorities for keeping career on track alongside family. We’ll also be discussing the solutions, successes, and lessons learnt by leading employers including IBM as a case study. In this lively webinar, James Marsh will be joined by Panellists including Jennifer Liston-Smith, Director, Head of Coaching and Consultancy at My Family Care, and Deborah Richards, Diversity & Inclusion Leader at IBM. Join Colin Watt, Chief People Officer, NCC Group and Chase Dolomont, Employee Engagement Strategist, Achievers, as they share practical advice on how to take your recognition and engagement programme to the next level for enhanced results in 2019. We have Gender Pay Gap data, so we have the beginnings of transparency. We have narratives exploring the drivers and action plans. But what are the specific building blocks of change for leading employers? How do you actually attract, retain and progress gender diverse talent and close the gap? . Jennifer Liston-Smith, Director, Head of Coaching and Consultancy at My Family Care, and a recognised innovator in the Parental Leave Coaching field. Ruth Thomas, Senior Consultant at Curo Compensation, summarising the learning from this year’s Gender Pay Gap reporting and its implications for your next year’s report. Carolanne Minashi, Global Head of Diversity & Inclusion, UBS, sharing the factors that really enable women to progress and reach the top at work. On Arup’s journey in EDI including the promotion of Shared Parental Leave. Earlier this year, Milkround investigated the minds of over 5,700 students and graduates, to find out how they feel about taking their first steps into the world of work. The research found out much about what graduates expect in from their early careers, with interesting insight into predicted salary expectations and the disparities between males and female graduates. Other points reveal the uncertainty around internships and the pressure respondents feel against those who have more work experience or are less in need of a high salary. Milkround will also present further interesting research around retaining employee’s and what graduates expect in the workplace, with practical advice and tips on how to introduce methods such as reverse mentoring into graduate training programmes. The webinar will present an opportunity for you to address your own thoughts and challenges around hiring and retaining graduates to discourage job-hopping and ensuring you are developing and shaping graduates in the workplace, and our expert panel will offer recommendations around these themes. In the competition for talent, doing something to smooth your peoples' transition to parenthood has become almost a hygiene factor. And legislative, economic and cultural factors keep gender diversity at the top of most organisations' agendas. Employers benchmarking against their sector find that maternity coaching, or - more inclusively - a parental leave programme, is now an expected provision in sectors such as banking, legal and professional services firms, and increasingly tech, insurance, media, fast-moving consumer goods and retail sectors. Many now provide blended (online and real world) programmes, whilst others have moved to purely digital solutions. Maternity coaching was first introduced on a wide scale in the early 2000s. Two decades on, the world and the way we work has changed enormously. In this lively webinar, James Marsh will be discussing the latest trends and developments and the drivers behind them, with Jennifer Liston-Smith, Director, Head of Coaching and Consultancy at My Family Care, and a recognised innovator in the Parental Leave Coaching field. We will also be joined by Diversity and inclusion specialists form leading employers, Citi and AIG. They'll be sharing their insights and experiences of the changing parental leave challenges in their organisations. The link between financial security and physical and mental wellbeing has long since been established. Employees have to deal with busy lives and the complexities of major financial decisions, as well as key life events such as bereavement, buying a home or nearing retirement. It is not straightforward. With nearly half of the UK showing one or more signs of financial vulnerability and 46% of UK adults saying that their knowledge of financial matters is low, it is more important than ever for employees to manage and keep on top of their daily finances. 50% of UK employees say that they feel their employers care about their financial wellbeing. But is there more UK employers can be doing to help and educate their employees on financial matters? In this webinar our expert panel will look at the importance of teaching employees good financial habits, budgeting and creating a 'savings buffer' to help them cope with the pressures of personal finance and economic uncertainty. By 2025, the biggest age group of employees is likely to be the over 50’s. People over 50 now make up nearly one-third (31%) of the entire UK workforce (up from 21% in the early 1990s*) and if growth continues at the current rate, will be the dominant group by 2025. Now, more than ever, employers need to consider how we can address the issues and opportunities for older workers and the wider workforce. Just as enabling work+parenting has become a hygiene factor for employers, it’s now imperative to address work+carers. The 50+ group often includes your senior talent and keepers of core knowledge and relationships. There are many further factors combining to make this a group worthy of some forward-planning: the baby boomer population bulge, increased longevity, more fluid retirement ages, more involved grandparents and changes to pensions (particularly for women). But whatever the reasons, the burning platform for employers is clear. In this webinar, we’ll be sharing our experts’ experiences and opinions and showcasing best practice for employers. Host and HR professional James Marsh will be joined by a range of employers, commentators and experts including Jennifer Liston-Smith, Director, Head of Coaching and Consultancy of My Family Care, and Deborah Richards, Diversity and Inclusion Leader at IBM. Deborah will share insights into how multiple diversity award winner, IBM approaches supporting carers in the workplace. Jennifer will be bringing a very broad perspective on the challenges for employers, and insights gained through her work with employers of different sizes and sectors. Also joining the discussion will be Daniel Pike, Co-Founder of Supercarers and Caroline Waters OBE, Vice President of Carers UK. They will provide an overview of the changing landscape of care and do some future-gazing on the work and care front. The workplace is changing fast and new radical developments are just around the corner, This webinar will explore the future of the workforce and how HR professionals can prepare their organisations for this brave new world. We will be looking at workforce automation, the impacts of new technologies, innovations in the use of data, the rise of AI and how tech can be used to enhance the employee experience. We will also explore the future skills market including what will be in demand, how to motivate and retain complex groups of employees, the future of the gig economy, flexible working contacts, changes to pension structures and more. The General Data Protection Regulation (GDPR), due to come into force on 25th May 2018, will impose a host of new legislation governing the use and storage of personal data affecting organisations across Europe. The new regulations include a substantial amount of additional reporting requirements, increased fines and penalties. However, all is not lost. This webinar will discuss the key changes under the GDPR and will feature expert advice surrounding key considerations for HR teams, impact analysis and practical tips whilst outlining the potential upsides of GDPR compliance in HR. While we know the facts, one of the biggest challenges for driving engagement across an organisation can be convincing the Board that employee engagement isn’t a luxury - it’s a necessity. Join us for 1 hour on Wednesday 7th March at 11am for a valuable webinar on the best practice way to build and present your business case for employee engagement. Leading the session will be James Marsh of HR Review; Denise Willett, Senior Director of Achievers EMEA; and Kerrie Maitland, HR Consultant, Life Coach and Managing Director of Positive Dimensions. They’ll be sharing strategy, techniques and ‘Been there, done that’ experience that you can apply to getting the executive buy-in you need. Put the date in your calendar now – and we look forward to you joining us! Current Childcare voucher schemes offered through employers will close to new registrants in April 2018. For many employers they’ve been the mainstay of their support for working parents. So what could/should employers be doing to support their employees. So in our spring webinar, we’ll examine the benefits and policies options and what other initiatives work for employers. We’ll also consider the pros and cons and the business case of everything from Backup Care to on-site childcare. Joining us to discuss the impact and ROI will be Oliver Black, Director of My Family Care. Lindsey Doe, Director Of Tinies, part of the My Family Care Group will also be on hand to provide an overview of the current childcare landscape and what employers need to know. We'll also be joined by independent reward, benefits and client Insight professional, Jackie Buttery and Adam Brooke, Vice President, Benefits Consultant at Bank of America Merrill Lynch who’ll be sharing their approach and insights into supporting their working parents. As well as reporting your gender pay gap figures by 31st March (public sector) or 5th April (businesses and charities), you have the option to provide a narrative with your calculations. This enables explanation for the reasons for your results, and give details about actions you are taking to reduce or eliminate the gender pay gap. With the deadlines looming, we'll be providing commentary and insights to help you with your explanations and your contextual narrative. The way you tell the story behind your data will be key in effectively positioning your results, both within and outside your organisation. It will influence how your figures are interpreted by current and future employees, by investors and the public. And it will set your platform for practical and effective action to address the gap. Host and HR professional James Marsh will be joined by a range of employers, commentators and experts including Jennifer Liston-Smith, Director, Head of Coaching and Consultancy of My Family Care and Lara Warburton, UK Diversity and Inclusion Manager at Rolls-Royce who will share insights on crafting a good narrative and planning effective onward action. Scott McKenzie, Joint Managing Director of Lansons, a strategic consultancy, specialising in corporate, media and political communications will provide a broader perspective. We're also delighted to be joined by Ed Bowyer, employment partner at leading law firm, Hogan Lovells to address the legal issues. In this webinar we'll be sharing our experts’ experiences and opinions including key points to consider from a reputational and employer brand perspective through to niche areas such as the impact of flexible working as well as unequal parenting and caring responsibilities on ‘the gap’. The experience shared will help you craft a true and impactful narrative for your organisation. What are the factors that keep your talented people on board through parental leave and return, and keep them progressing afterwards? What do leading employers do to increase the chances of success? And where does coaching fit into the mix? We're delighted to invite you to our upcoming webinar on 15th November, where we'll hear be sharing leading employer case studies, our latest research and insights into best practice. Maternity and parental leave coaching is now an accepted way of supporting and retaining women through the new parent transition. The ways it can be delivered have expanded to include group and one-to-one coaching, in person, remotely and online. In this webinar Jennifer Liston-Smith , Director, Head of Coaching and Consultancy will be sharing insights from her many years’ experience in parental leave coaching and the measurable impact it can have. We’ll also be sharing the results of a collaborative study with independent researcher, Jane Moffett, on the impact of My Family Care’s coaching as part of her Masters in Coaching & Behavioural Change at Henley Business School. We'll explore all the factors that positively influence a new parent’s transition back to work after leave, leading to practical take-aways for you to implement. ‘InsiderHR’ is an educational resource that lets human resources professionals explore contemporary HR issues in a level of depth unavailable through more traditional avenues. Channelling valuable thought leadership from experts and academics to those actively involved in the HR field, delivering knowledge to transform HR practitioners’ approach in a challenging and ever-evolving business environment. Title: Leading digital transformation in HR: Are you ready?